After looking at the gallery above, I think that you can agree when I say that David and Ella's relationship is a good one is an understatement. They have such a beautiful bond and that is what was the most apparent to me when I got to hang out with them for a few hours the day I took their photos. They support each other artistically : Ella sits as David draws her, isn't that the sweetest thing? Getting to be in the room and watching David and Ella at work really was special. Then just getting to hang out with them and talking to them was SO MUCH fun! They are two talented and cool kids with radiating personalities! Can we also talk about the fact that they have a handshake?! Heart melted. Also, David shared with me that he prefers to have the subjects he draws be present instead of using a photo for reference which if you ask me is advanced ... the thought of drawing someone in person still gives me a grown woman, nerves! 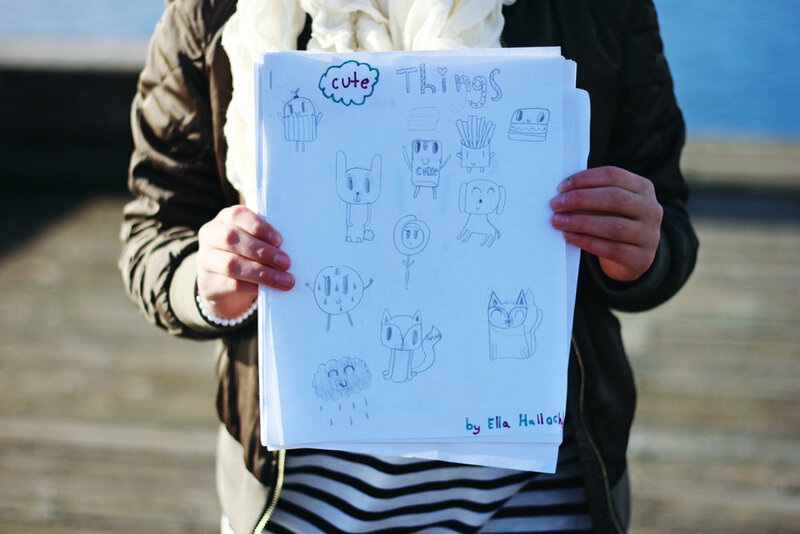 Ella shared her love of drawing cute things and writing stories to go along with her illustrations. David and Ella's parents are doing an amazing job nurturing not only their kids natural creative talents, but their best friend sibling bond and that is VERY inspiring! I can't wait to watch David and Ella's journey independently and together! Keep an eye out for these two! They are world changers in the making!! Here's a mini Q & A between David + Ella's Mami and Daddy and David + Ella. Q: DO YOU LISTEN TO MUSIC WHEN YOU CREATE? IF SO, WHAT IS YOUR FAVORITE SONG TO LISTEN TO? A: No, I don't like to listen to much while I draw I find it easier to concentrate in a sunlit room with minimal noise. Q: WHAT TIME OF DAY ARE YOU MOST INSPIRED TO MAKE ART? ARE YOU A MORNING PERSON, NIGHT OWL, OR DO YOU FEEL CREATIVELY INSPIRED ALL DAY LONG? A: I feel most inspired in the morning when light floods the room and I'm awake and refreshed. 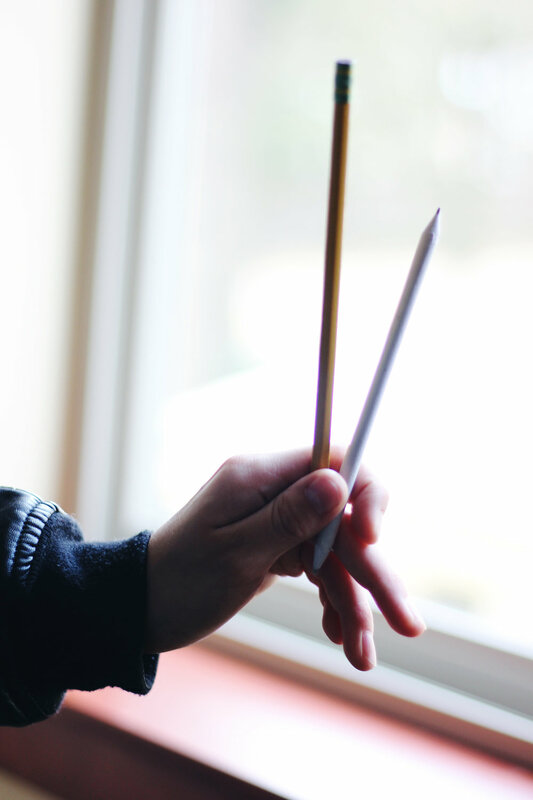 Q: DO YOU TAKE ART CLASSES OR DO YOU PLAN ON TAKING MORE IN - DEPTH COURSES TO GROW ARTISTICALLY? Q: IS THERE A PLACE OR A PERSON THAT INSPIRES YOU TO CREATE? A: Loral Birch, I think of my cute stuffed animals and also I love animals so I like to write stories about them. Q: IS PENCIL DRAWING YOUR FAVORITE WAY TO DRAW OR ARE THERE OTHER TOOLS YOU WOULD LIKE TO LEARN HOW TO USE? A: I want to learn how to use oil pastels. I also enjoy using my gel pens, colors and markers. I also love creating pretty things from nature. 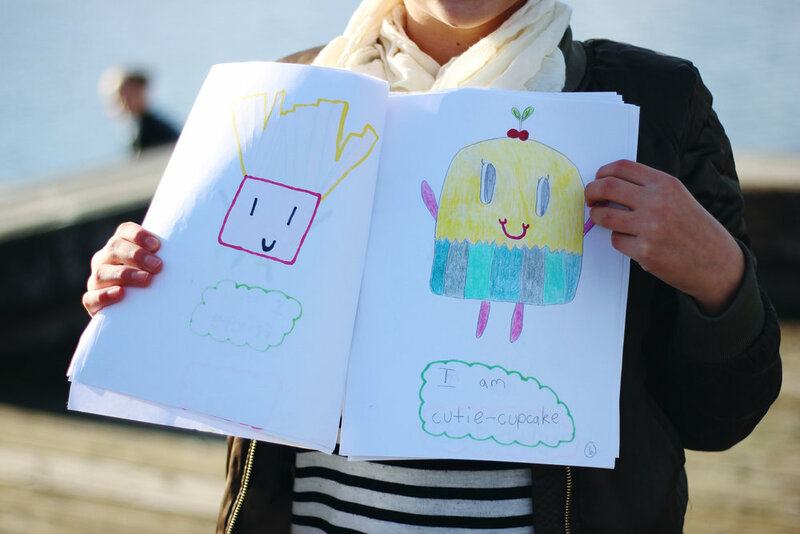 Q: I KNOW THAT YOU HAVE A GIFT FOR ILLUSTRATING YOUR OWN HANDMADE BOOKS, WOULD YOU EVER LIKE TO HAVE ONE OF YOUR STORIES PUBLISHED? 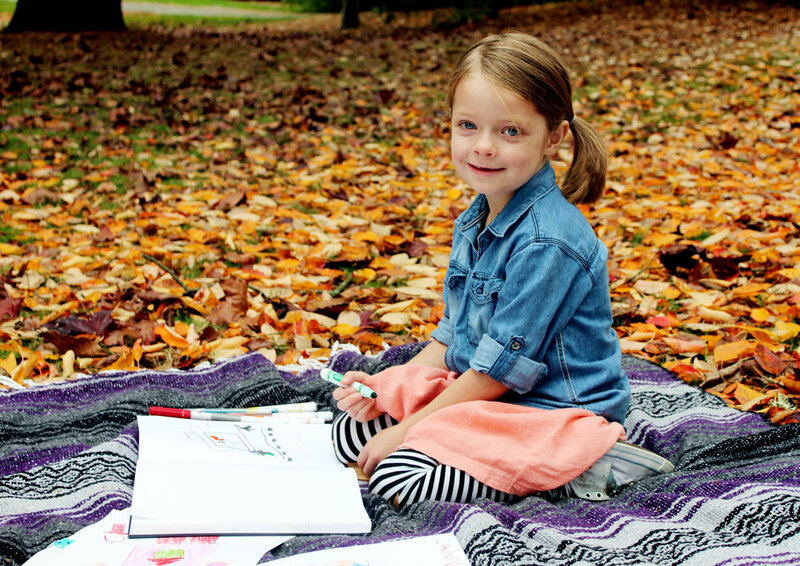 We began to see creativity with David and Ella at very early ages when they would draw or paint around age 2 and 3. David paid close attention to the detail in the way things looked around him and liked to draw realism at a very young age. Ella was very drawn to creating art that was detailed and colorful. As they both grew up we kept all of their artwork year after year so that they could reflect back on their imaginative artwork as they got older and could see the progression of change in creativity over their childhood years. Both kids showed a passionate desire to read both fiction and nonfiction books frequently which inspired great imagination in both of them to create their own artwork. 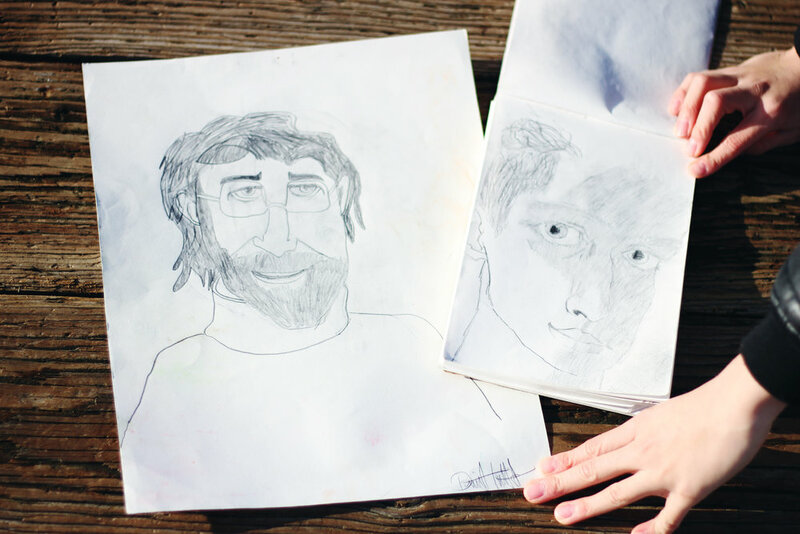 Both kids seek to be individuals who create unique artwork that is a reflection of their own souls. David and Ella’s grandfather and uncle are well known painters in Mexico and the desire to create art runs in the blood of our family lineage. 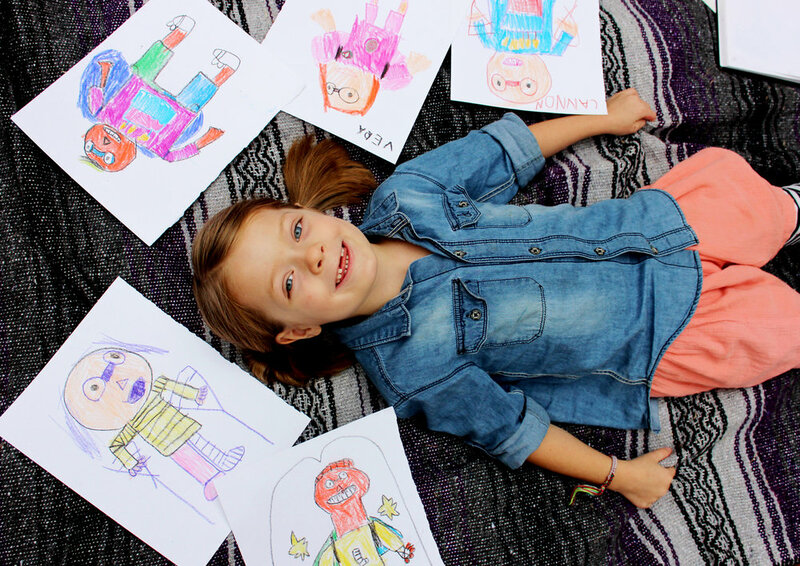 There have been times when both of our kids have been relentlessly creating art without being prompted or given artwork assignments, they simply have had a strong desire to be creative and artistically express what comes out of their individual souls. There have been times where the kids will create artwork for hours on end, going from one project to the next letting the pure creativity pour out of them. Q: WHERE DO YOU GET YOUR IDEAS FOR YOUR DRAWINGS? A: I just think about it. I ask myself, "how cute can I make this art?" Q: WHAT KID OF ART TECHNIQUE WOULD YOU LIKE TO LEARN NEXT? A: I would really like to do some sculptures. Q: IF YOU COULD CHOOSE ONLY 2 COLORS TO WORK WITH ON A PROJECT, WHAT WOULD THOSE COLORS BE? A: Pink and Purple. Definitely. Vera wakes up in the morning ready to create. I literally trip over her and her art supplies as I try to get the coffee started! I think her creativity has definitely increased since she started school last year. But she has always been a huge fan of coloring and play-dough, even as a toddler.